- Versatility of cutting in any direction. - Built in Chip Breaker Groove. Ready to use. - No. Grinding - No Tool Resetting. Economical Alternative to Brazed Tool Tips. Being an eminent organization in the industry, we are involved in providing a premium quality range of Turning Tool Holder. - Heat Treated and Hardened. - Provided with one Wrench. - Available in Straight, Left and Right Hand Shanks. - Supplied with or without tool bits of Standard Length. To meet the various requirements of the customers, we are involved in offering a wide assortment of Turning Tool Holder. 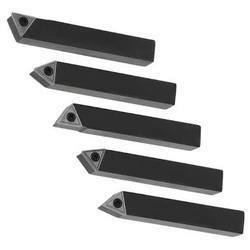 These holders are offered to the customers in precise hardness and thickness. Our holders are used for various industrial applications across the country. Manufacturers use latest technology and optimum quality material to ensure their long lasting and consistent performance. By keeping track with the market development, we are occupied in providing our clients with excellent quality External Groove Tool. 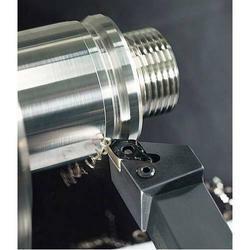 Shivang Engineering Solutions offer Turning Toolholders, which is used for both external and internal turning purposes. - CNMM 1204.. - CNMG 1204..
- CNMM 1606.. - CNMG 1606..
- CNMM 1906.. - CNMG 1906..
We are engaged in manufacturing and supplying Turning Holders to our customers. Our experts perform rigorous quality check measures and thus, introduce the preferred range with flawless characteristics. Easy to install and imparted with uniform finish, these holders have gained wider market acceptance. Aimed at prosperous growth in this domain, we are instrumental in offering an excellent quality range of Turning Tool Holder. Our clients can avail from us a comprehensive spectrum of standard Turning Tool Holders, which is used for both external and internal turning purposes. As per the needs and requirements of our clients, we are involved in providing External Turning Holder.